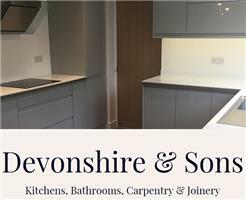 Devonshire and Sons - Bathrooms, Carpenter, Kitchens based in Frimley, Surrey. We have over 16 years of experience in Carpentry, Joinery and Building works. Devonshire and Sons carry out kitchens, bathrooms, wardrobes and all carpentry and joinery works. We are a family business located in Camberley, Surrey. We cover all areas in Surrey, Hampshire, and Berkshire. Devonshire and Sons have a team of highly skilled carpenters, electricians, plumbers and plasterers to complete every project to the highest standard.